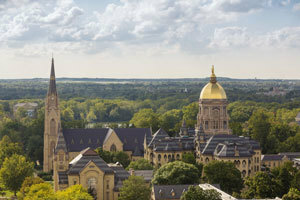 The University of Notre Dame endowment pool remained essentially flat for the year at $10.4 billion with a return of -0.3 percent, according to Scott Malpass, vice president and chief investment officer. The University benefited from spending distributions of some $343 million for the fiscal year, representing more than 25 percent of the University’s expenditures during the year. Endowment pool distributions have more than doubled in the last decade, with an annualized increase in endowment spending of 9.1 percent. In what the New York Times described as a lackluster year for university endowments, the average return among endowments that have reported so far is a loss of 2.7 percent, according to the management firm Cambridge Associates. Notre Dame’s spending and investment policies provide substantial levels of cash flow to the operating budget for current students and faculty, while preserving endowment purchasing power for future generations. Almost 33 percent of spending from the endowment is specified by donors to support student financial aid in the form of scholarships and fellowships. Nearly 20 percent is dedicated to support professorships and teaching. Almost 20 percent is designated for academic, religious and student programs. The remaining endowment funds are donor-designated to support specific departments or programs or are available for general University purposes. Notre Dame’s longer term results are in the top tier of institutional investors. Over the past 10 years, the Notre Dame endowment pool achieved an annualized return of 8 percent. During the same period, the global equity markets, as measured by the MSCI All Country World Investable Index, increased by 4.5 percent per year, while the global bond markets, as measured by the J.P. Morgan Global Bond Index, increased by 4.6 percent per year. The endowment pool grew from $5.1 billion to $10.4 billion over the 10-year period. Similarly, over the past 20 years ending June 30, the endowment returned 11.2 percent per annum compared to the median return of 7.5 percent for large institutional investors broadly. “I am delighted to see the impact of these returns in the advancement of the academy and student life, and especially in the financial aid resources available to our students,” Malpass said. The Notre Dame endowment pool also has substantially outperformed its internal strategic policy portfolio, representing a passively indexed portfolio of similar assets, which returned 4.2 percent and 6.9 percent over the prior 10- and 20-year periods, respectively. On this basis, the University’s actively managed investment program created value-added of $3.1 billion over the past 10 years and $6.1 billion over the prior 20 years. Originally published by Dennis Brown at news.nd.edu on September 30, 2016.